The Xbox One now has a new service which makes a better choice when comparing it with the PS4. Today EA Games announced its subscription service called EA Access which gives Xbox One owners the best games from EA and play them for how long they want. Once it launch, EA Access members will be able to download FIFA 14, Madden NFL 25, Battlefield 4 and Peggle 2 through The Vault, more games will be added as the program gets older. Free games is not the only perk EA Access members will have. 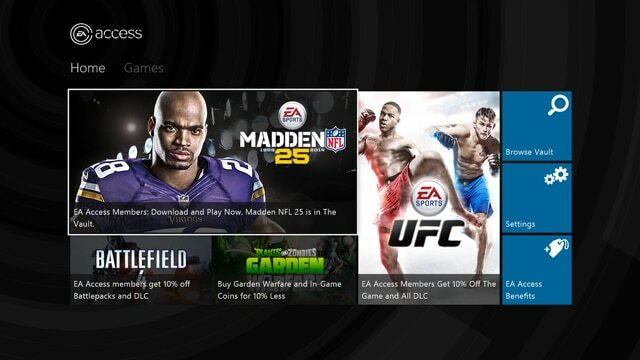 The service will give its subscriber an exclusive 10% discount on EA digital purchases on Xbox One. One thing we can all agree is that we all love to play games before they’re officially released, and that’s exactly what the service will give their subscribers as well. EA Access will let you download EA games five days before they’re released and then allow you to purchase it and continue where you left at. EA Access will be to all Xbox One owners in Europe, Canada, and US for $4.99 per month or an annual membership of $29.99 per year on Xbox LIVE. You will be able to purchase the membership at Gamestop retail stores or Amazon.